Tiramisù is an exquisite and stylish design object, thoroughly designed and manufactured in Italy which has been studied to meet the requirements for those who utilize the notebook all day long. 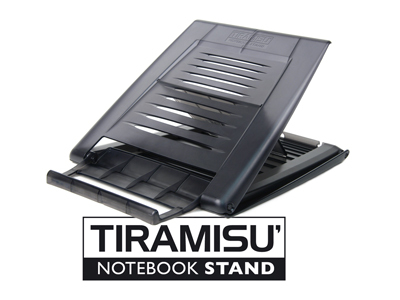 Tiramisù tilts and lifts the notebook from the table, allowing the user to adjust the LCD screen's height and consequently to keep a correct posture while working giving immediate benefits to the body, particularly back, neck and wrists. Its unique architecture helps the notebook's cooling process by increasing its natural ventilation. No more mess on your desk thanks to the exclusive support for fixing the cables in a safe and optimal fashion.